We have a wide range of products in our Dive shop - from usefull clips and accessories to full sets of kit, check out our online store here, or come in and have a browse. Air/Nitrox/Trimix we are the largest fill station in Weymouth - click here for prices and more information. Servicing: our technicians are often able to see to your equipment 'in house', or arrange servicing if necessary. For prices and turn around times click here. 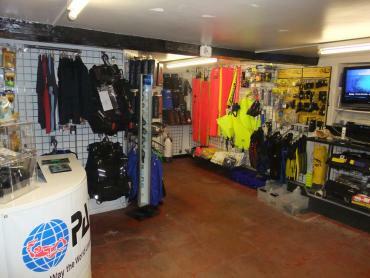 Equipment rental is available for local trips or dive holidays, find our prices here. We also have a small cafe in our dive shop - come in and have a browse or chat to our team while enjoying a coffee or one of the best ice creams Weymouth has to offer! Parking can be found next door or in several nearby locations - you can find where by clicking here.